We didn’t plan to spend so much time in the Cambodian capital. 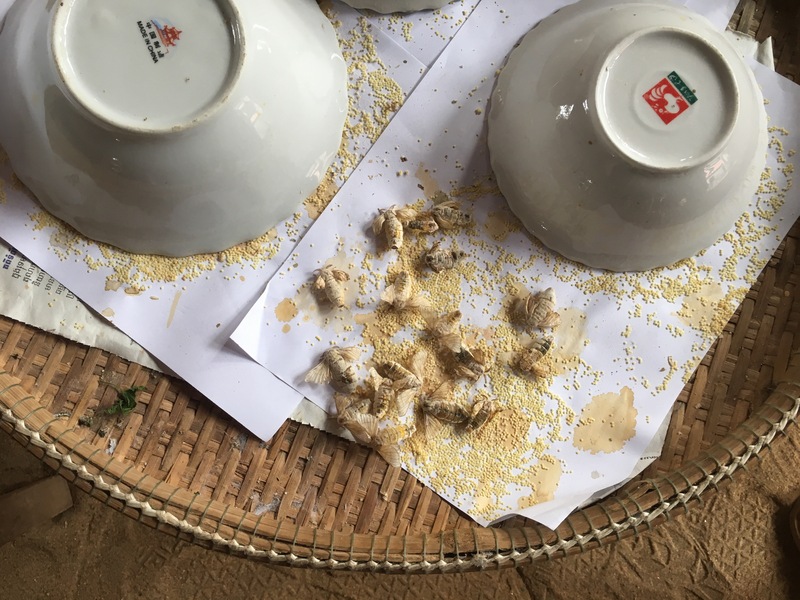 But our initial plan of flying to Hong Kong for a few days didn’t work out, so we ended up with a lot of time on our hands in Phnom Penh. We woke up early to catch our 8:30 bus. It was hard saying good bye to our beautiful hotel and the very friendly staff. But we were excited to travel to the capital. 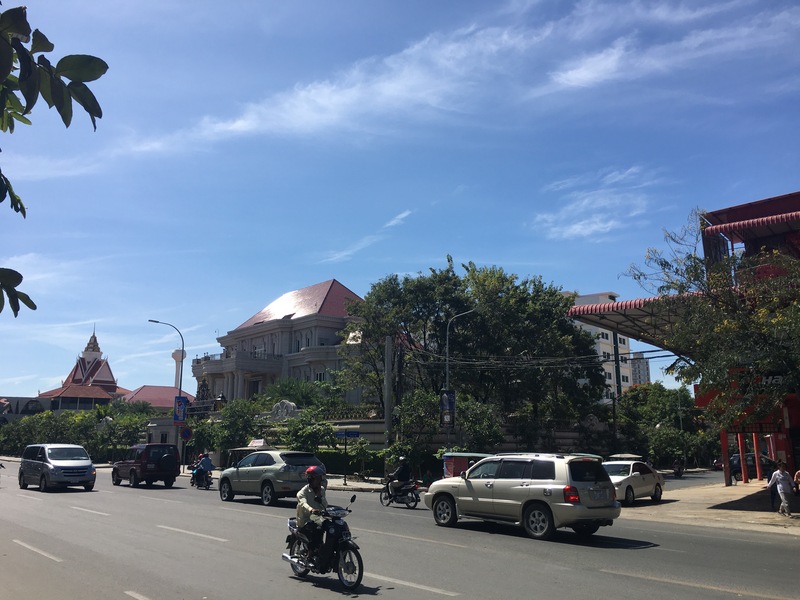 Compared to the ride from Vientiane to Luang Prabang, the trip from Siem Reap to Pnomh Penh is a mere 6 hours on good roads with appropriate infrastructure. The overall aspect and smell of the bus were better and inspired more confidence. But it can’t be all sunshine – the seats were cramped and tiny, the lady in front of me fell asleep with her head on the curtains, so I was baked by the sun the entire time, AND THERE WAS A BABY BEHIND ME. We made one stop at a street food stall that sold deep fried insects and fresh fruit. The only positive aspect was that we were allowed to use the restrooms of a nearby restaurant so we didn’t have to repeat the misery of the previous trip. Needless to say, I was not amused. Andreas, naturally, was oblivious to everything, and still insists that the ride was fine. We agree to disagree :). 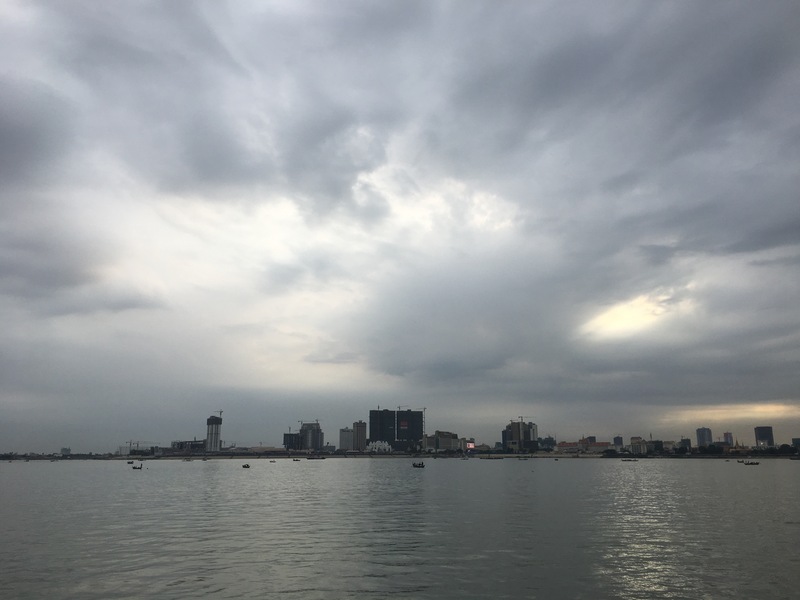 Phnom Penh is a big city, loud and crowded, dusty and chaotic. We arrived there late afternoon and, after resting a bit, we went out for some dinner. The closest place was a French crêperie that got good reviews on Foursquare, so we opted for a non-Asian dinner. The crêpes were delicious, and I was reconciled with the day. What to do in PP? 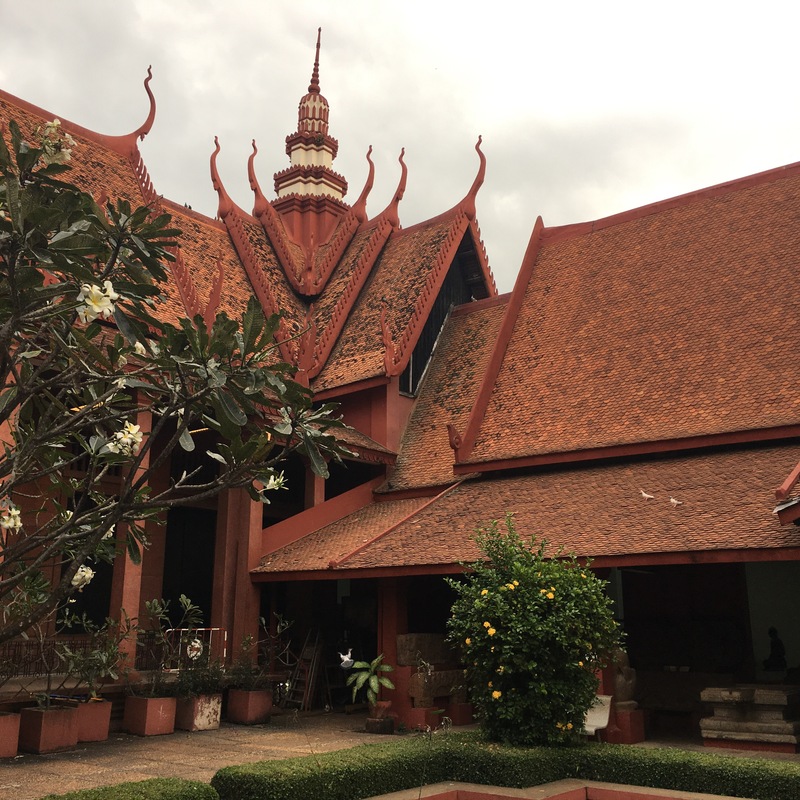 It’s not exactly the pinnacle of culture, since most of the city and its heritage was destroyed during the 4 years of Khmer Rouge regime (1975-1979). 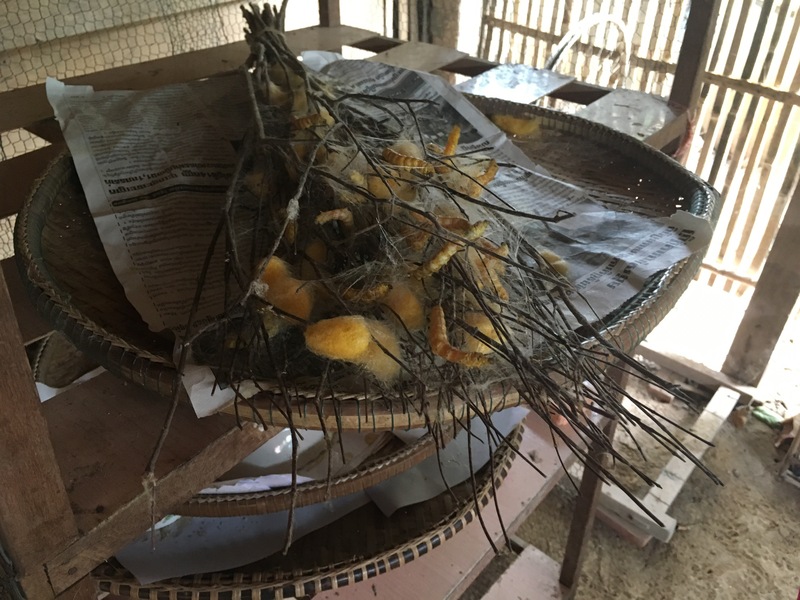 We booked a guided tour to a former Khmer Rouge prison and to the Killing Fields for Thursday, but this left us with 2 full days of endless possibilities. We spent the entire day in the only Cambodian mall. Now that you are done judging, let me continue :). The Aeon mall is the only western- type mall in the whole of Cambodia. It was built by Japanese investors and offers mostly Japanese brands. It was a good place to escape the heat and the dust. We walked to the mall for about 30 minutes through busy traffic, trying hard not to die. Very few people walk here, which is understandable given the heat and the dirt and the dust and the life-threatening walking conditions. The locals watched us with some amusement as we navigated our way around the speeding traffic, sometimes helping us cross the streets by jumping in front of mopeds and holding out their hands for them to stop and let us by. I rarely feel as useless as I do when trying to cross the street in Asian countries. There’s not much to tell about the rest of the day. I bought a skirt. Andreas had a Starbucks coffee and a soup. It was all extremely exciting. And in the evening we had pizza. It can’t all be exotic all the time. This’s was the day for exploring the city. We had breakfast at a nearby cafe and lingered there for more than an hour. Then we walked to the monument of independence – a very ample construction in the middle of an insane roundabout. Somehow we got through the roundabout unscathed and proceeded to walk down the boulevard towards the Royal Palace. The streets were pretty empty as it was close to lunchtime. 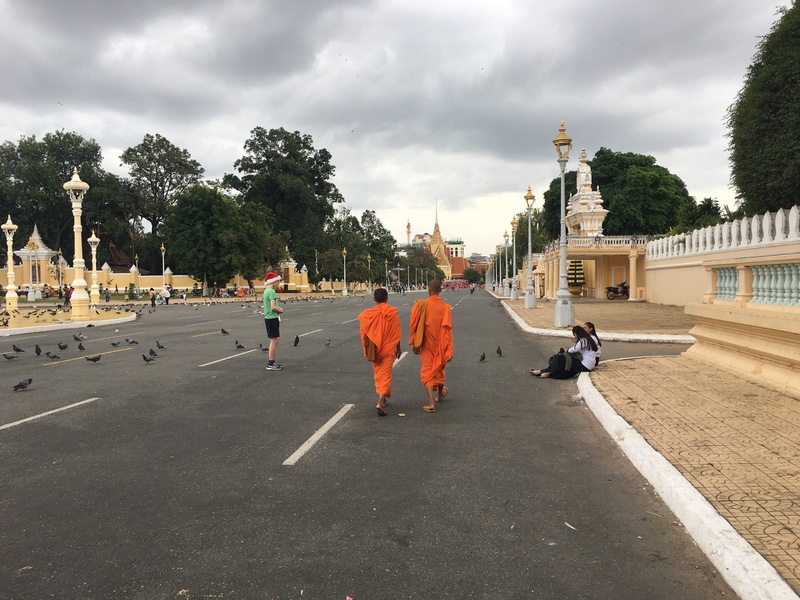 A few rickshaw drivers offered to show us the city and one particular one was kind enough to point out to me that my shorts and t-shirt will not get me into the royal palace. We politely declined their offers but we did go back for me to change and cover my sinful shoulders and knees. Andreas knees are not sinful apparently. Men’s body parts are much less prone to elicit corrective fashion measures methinks. Me freshly covered from head to toe, we walked the same route back to find out the Palace only opens at 2PM. This was a great opportunity to check out the Foreign Correspondent´s Club at the riverside. 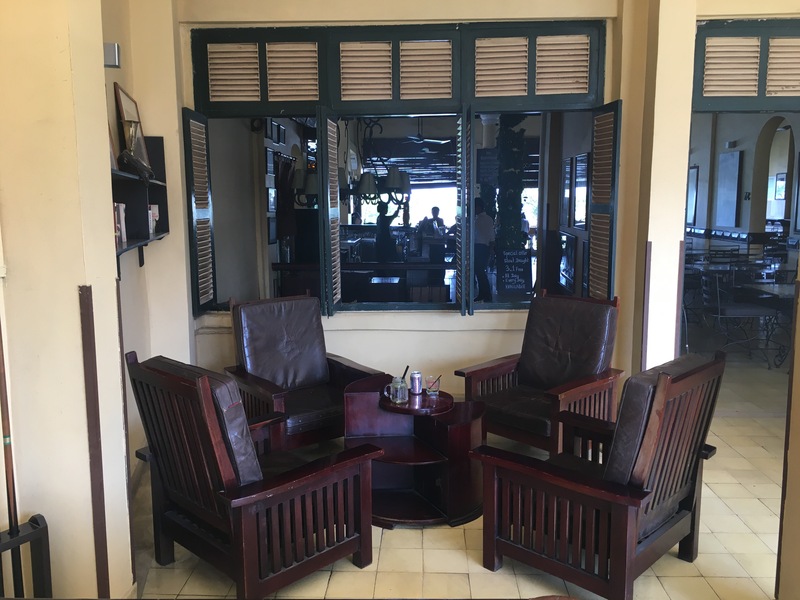 This place – as the name suggests – was the meeting point for journalists and other foreigners in Phnom Penh, before the Khmer Rouge took over and afterwards as well. 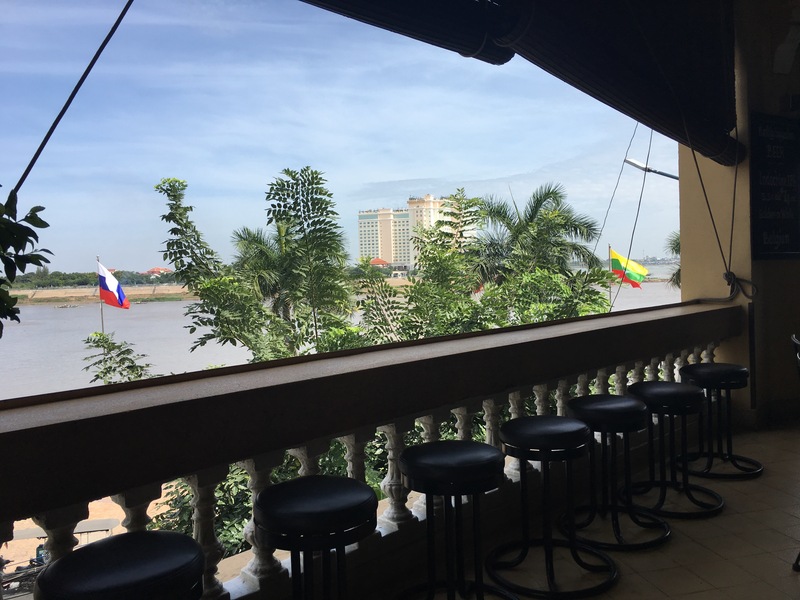 Today it is a regular bar with a wonderful view over the Mekong, it servers food and a plethora of cocktails, spirits and other drinks. Pictures and newspaper cutouts printed high scale cover the walls – a constant reminder of that gruesome era and its victims. We had a small snack and a mocktail and continued our walk to the palace. It was nice, but not impressive. 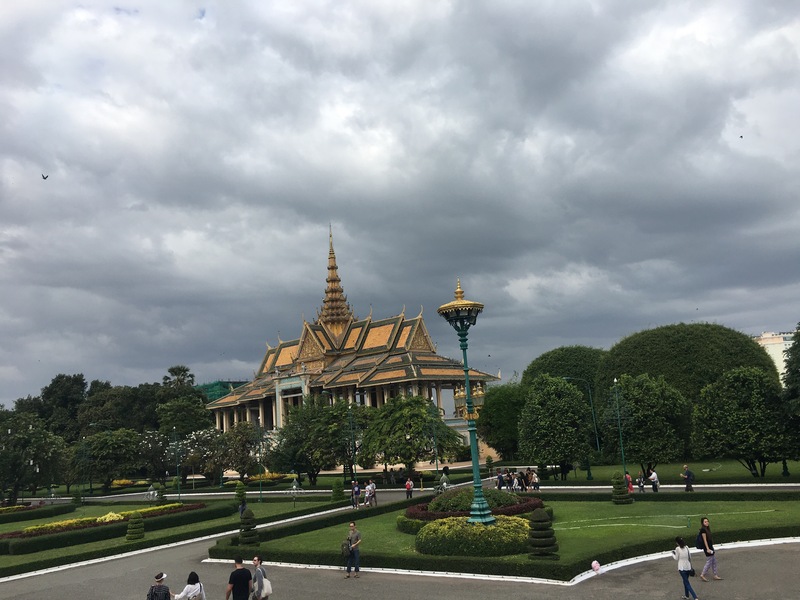 The king resides there, but the buildings that he and his family use, are in a restricted area that covers about half of the palace grounds. We walked around taking pictures of pagodas and left after about 20 minutes. It was so green and clean in comparison to the busy dusty city. The highlight of the day was the visit to the national museum, where we got to see ancient Buddha, Vishnu, Shiva and Rama statues in all sizes and positions, more or less intact or restored. Also, we learned about Cambodia´s involvement in WWII in support of the French. As many as 3000 Cambodians went to war for France and most of them perished ,of course. To wrap up the day we went to the Farm to Table restaurant. They were closed for a team event so we ended up in an Italian restaurant up the street from our hotel. It was full of tourists but the pizza was better than the night before so it was all good. This day was rough. 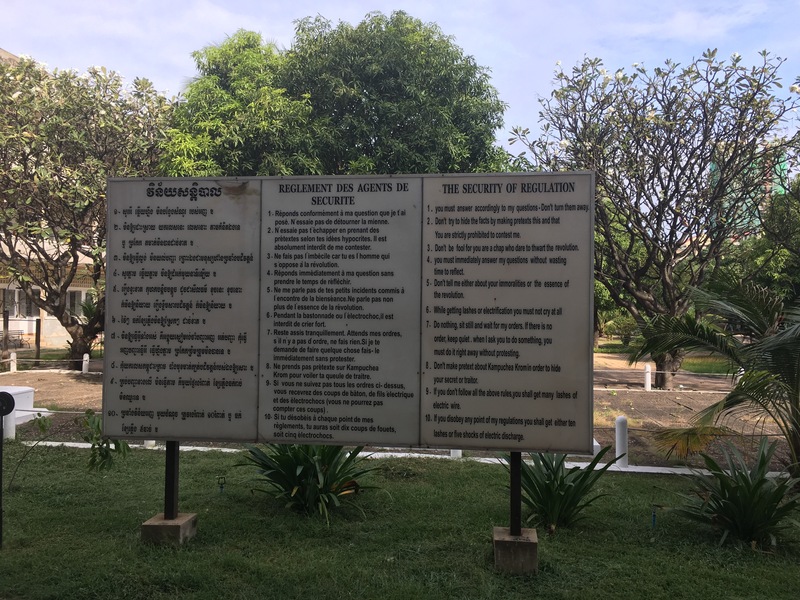 We visited the Tuol Sleng Genocide Museum (security Prison 21) and one of the Killing Fields near the Cambodian Capital. 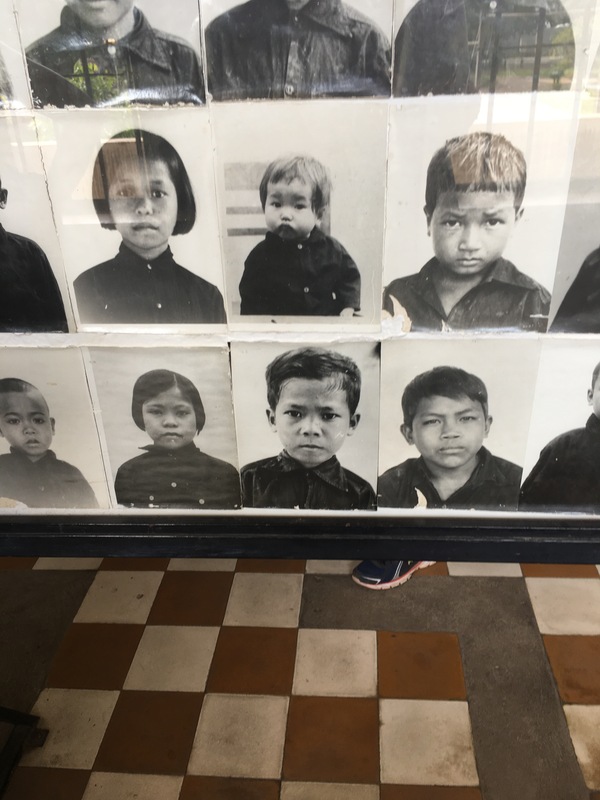 There are no words to describe the atrocities and pure evil that went on there, and all over the country during the Khmer Rouge regime. This is an extremely oversimplified version of the events leading up to the massacres. 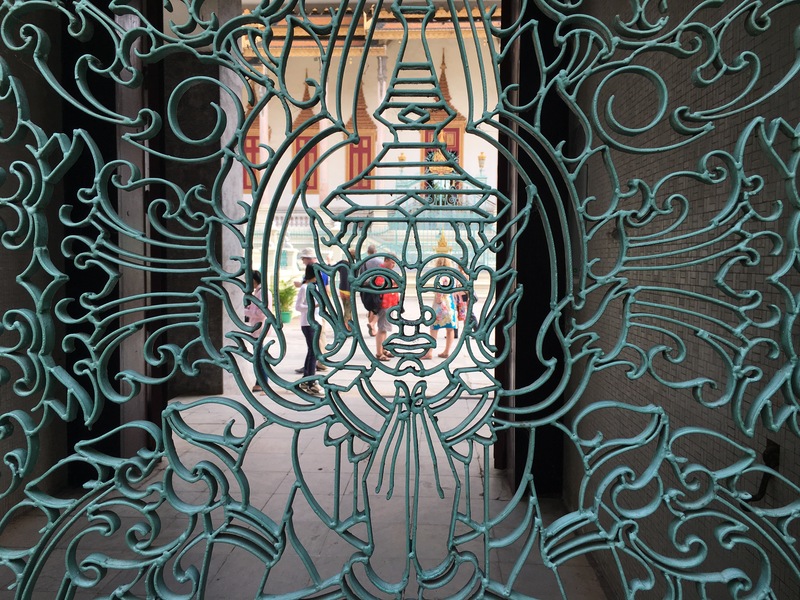 It all started “innocently” enough throughout the 50s and 60s of the 2oth century, with Cambodia making diplomatic and political attempts at reclaiming the Mekong delta that had been given to the Vietnamese when the formerly colonized French Indochina became independent. This united the country and gave the population a common enemy and a goal. To achieve this goal, a new political movement emerged and, in 1975, it came under the leadership of Pol Pot (not his real name but possibly an abbreviation for “Political Potential” or a reference to the “Pol” an aboriginal people used as slaves- his real name is Saloth Sar) who was named prime minister. Incidentally, Pol Pot´s sister was the king´s girlfriend or concubine at the time of Pol Pot´s rise to power.He had been politically active against the Vietnamese for years before he took the lead, so he was well connected and had influence. The Khmer Rouge took over Phnom Penh in April 1975. The population was evacuated under the pretext of protection from the Vietnamese and moved to the country side into labor camps. This was repeated throughout the country, with specific focus on intellectuals or those who looked like they might be scholars or knowleadgeble in any way (wearing glasses or having smooth hands was a dead giveaway and landed many a Cambodian in detention and torture chambers). The Khmer Rouge´s expressed goal was to transform the country into a classless rural society and collectivize all agriculture. To do this, all intellectuals had to be eradicated. However, most of the officials in the regime were university educated. Throughout the next 4 years, Cambodia´s population was subjected to persecution, inprisonment, torture and murder. The official reason was resistance against the Vietnamese, looking for and punishing traitors and their associates, as well as purging the country of those damned learned people. However, what lied at the heard of this “cleanse” was the insane conviction of a man that he is surrounded by enemies and must make rid of them. In less than 4 years Pol Pot had 25% of his then 8 million fellow Cambodians (children, women and men alike) brutally murdered. The “evil” had to be pulled out at the roots. Security Prison 21 used to be a school. It is located centrally in Phnom Penh and today it is surrounded by busy streets, apartment buildings and shops. When it functioned as a prison it was divided into 4 buildings: A, B, C and D – with A being reserved for the VIP prisoners. The cells in A were half the size of a regular classroom and held one iron bed with a chain tied to it. 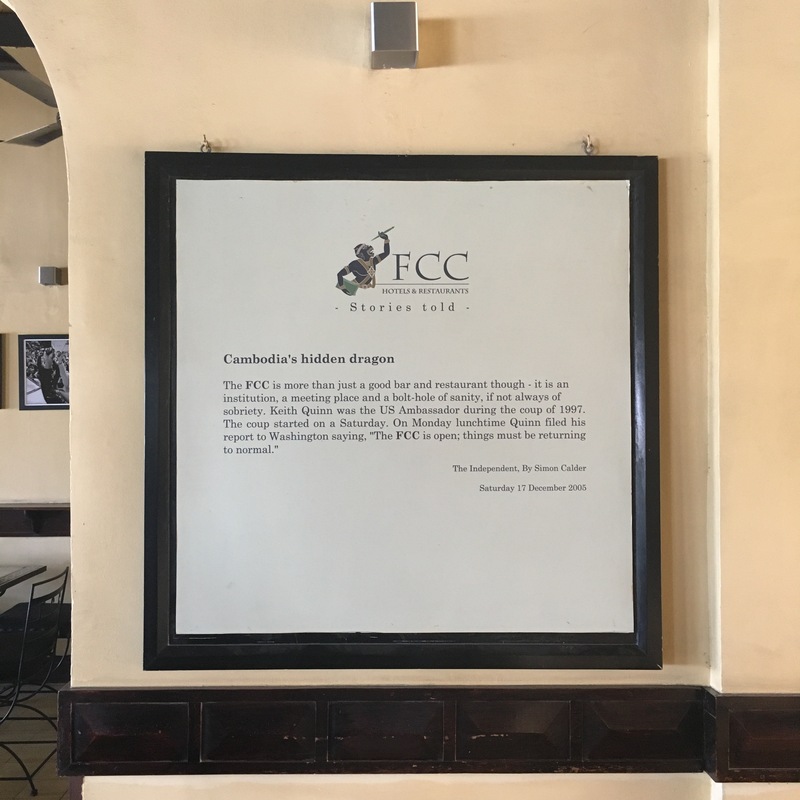 Prisoners were tied to the chain and, if the guard heard the chain rattle – meaning the prisoner was moving without permission – the prisoner would receive a beating or be tortured until they lost consciousness. Building D was reserved for mothers with small children, while B and C were for the common folk. B and C had each former classroom divided into 11 tiny cells. You can still see the haphazard brickwork today, testimony to the haste with which they were built. Walking around as a tourist today it´s hard to keep your composure. Unless you are a group of Chinese tourists taking selfies – they seemed unfazed. The stories of what happened inside those walls combined with pictures of the prisoner were chilling and shocking. I hesitated before posting pictures of their faces. But that little boy in the middle there really melted my heart with his defiant look. There had been no humanity there, no compassion or empathy. Just fear and rage and blood. An estimated 17.000 people died at the prison alone. 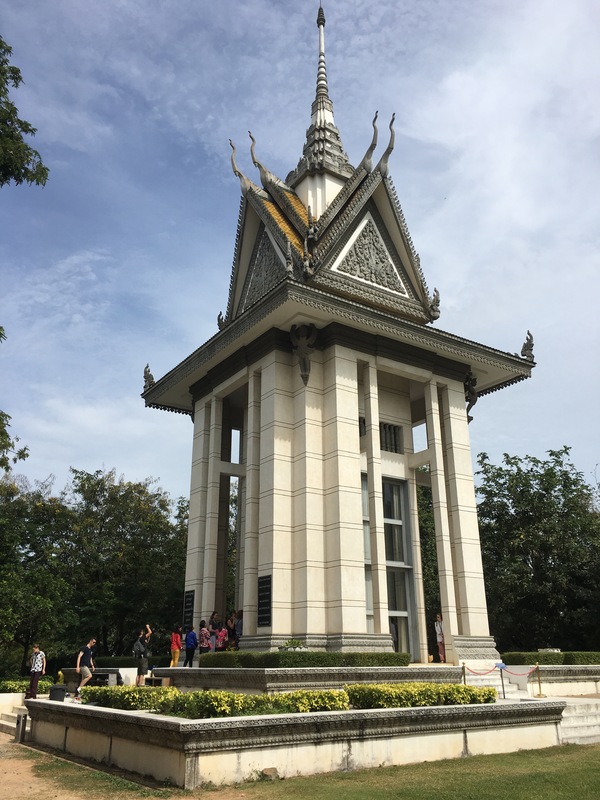 Many more were first held there and tortured before being taken to be killed at the killing fields. There were 5 survivors in total. We met 2 of them – both wrote books about their experiences. They are old and receive no allowance from the state. One of them saw his wife being slaughtered in front of him. The road to the Killing Fields took us a bit outside Phnom Penh, again through bustling markets, busy traffic and the general day to day of a country capital. 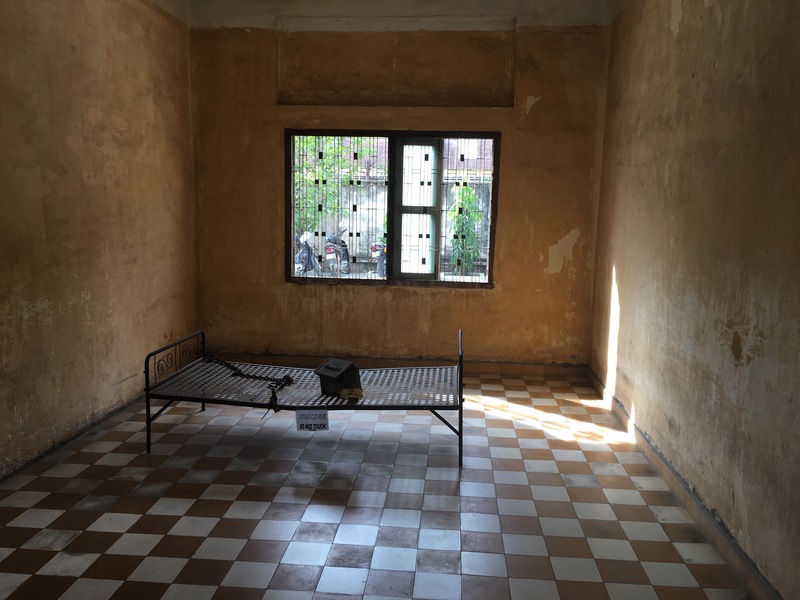 It was eerie to be back in the real world after having experienced Tuol Sleng. 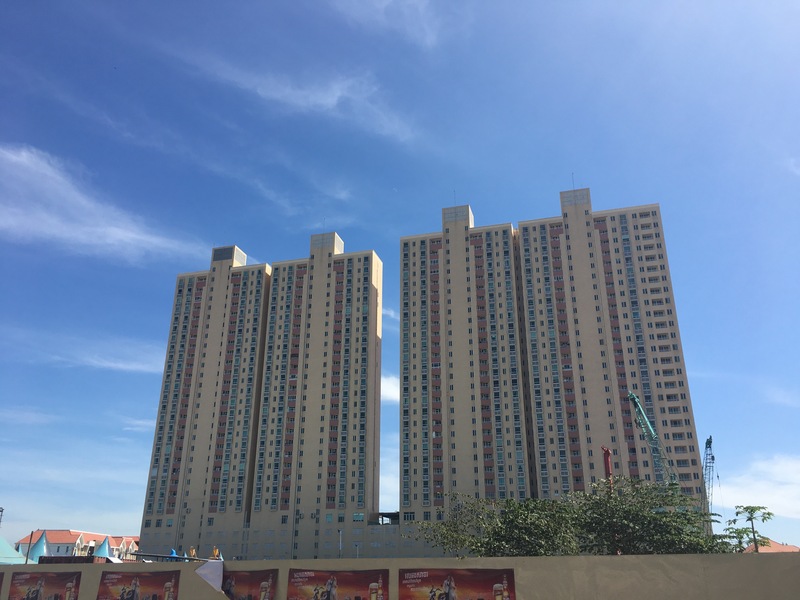 We arrived at what looked like a small park with a giant tower construction in the center. The tower holds a giant glass shelf filled with skulls belonging to those murdered and buried in mass graves in the surrounding fields. We walked around the park and our guide pointed to us: a tooth, some rags, a bone – the rain sometimes washes the remains out of the earth. We stopped at the “magic tree” which got its name from having been used to hold the speakers that blasted music while people were killed. So that the villagers wouldn’t hear. Another tree was used to smash babies against. In front of the mothers, before the women were raped and murdered. Humans can be the most inhumane animals. 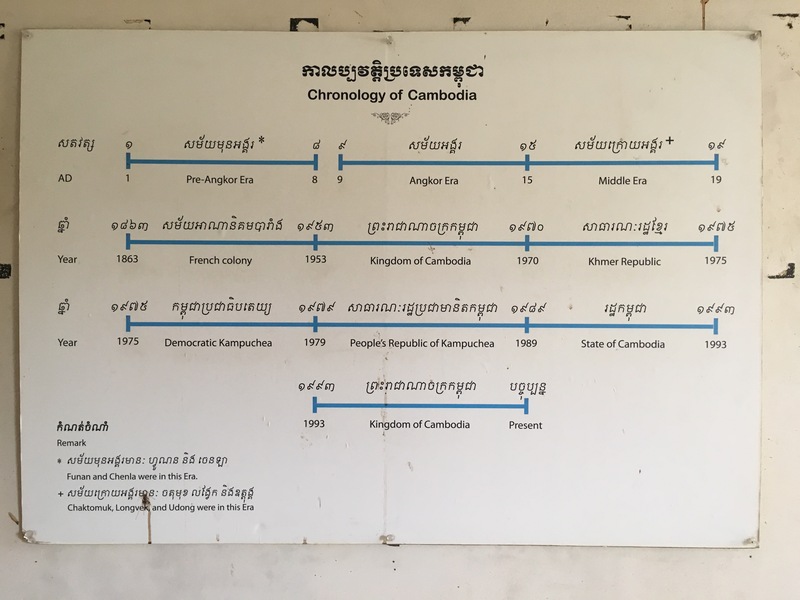 This is not something that Cambodia´s government today is proud of. This part of history is not taught in schools. Many people living in rural areas are unaware of these atrocities. With no survivors left and a population that is relatively young, there are fewer and fewer people who keep the history and its consequences alive for future generations. Apparently, some of the member of the regime are still active in politics today. 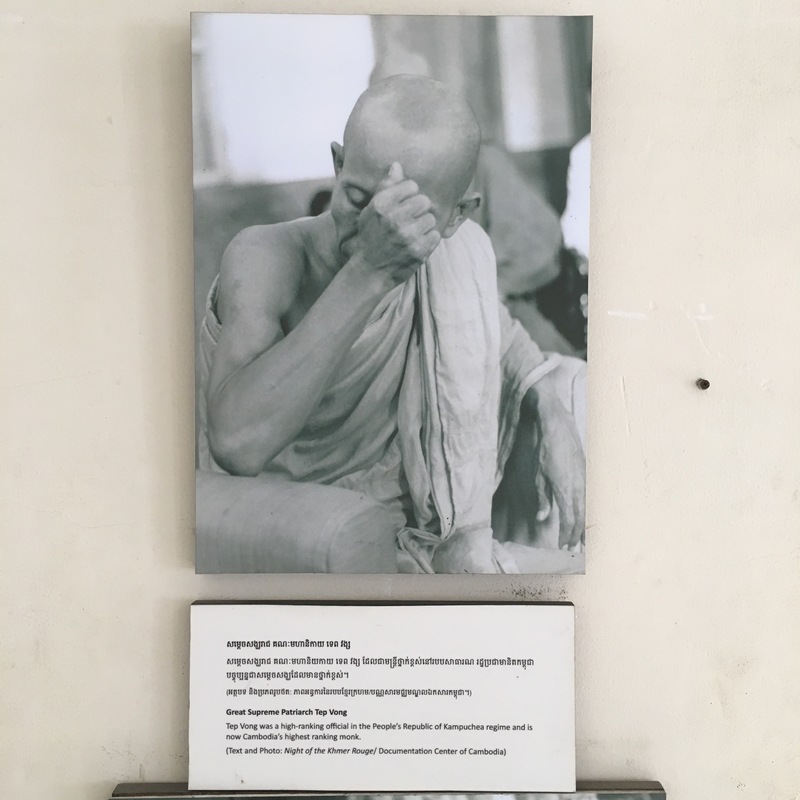 The country´s main buddhist monk used to be in the Khmer Rouge. Pol Pot was never even tried. He died of a heart attack in 1998, one day before his trial was due to start. There is a lot more to say about this, and a lot more for me to read upon to understand the complex political and historical implications that have led to the genocide. Suffice it to say that neither Europe nor the US bothered to intervene. This happened on our watch, while ABBA was hitting the charts. If we don’t know our history, we will repeat it. The US is the best example, especially on the day that I am typing this: Friday, January 20 2017. 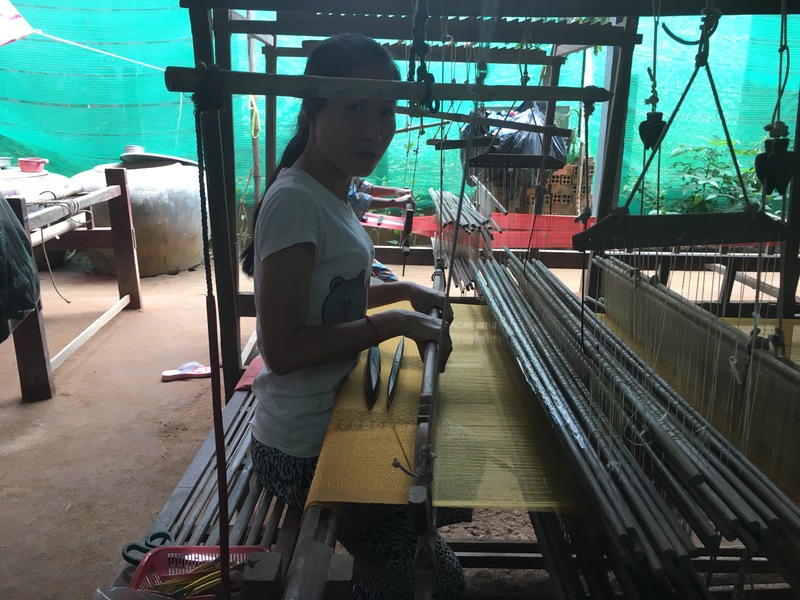 To get a little bit of positivity into this day, we visited a family that makes silk and silk products. 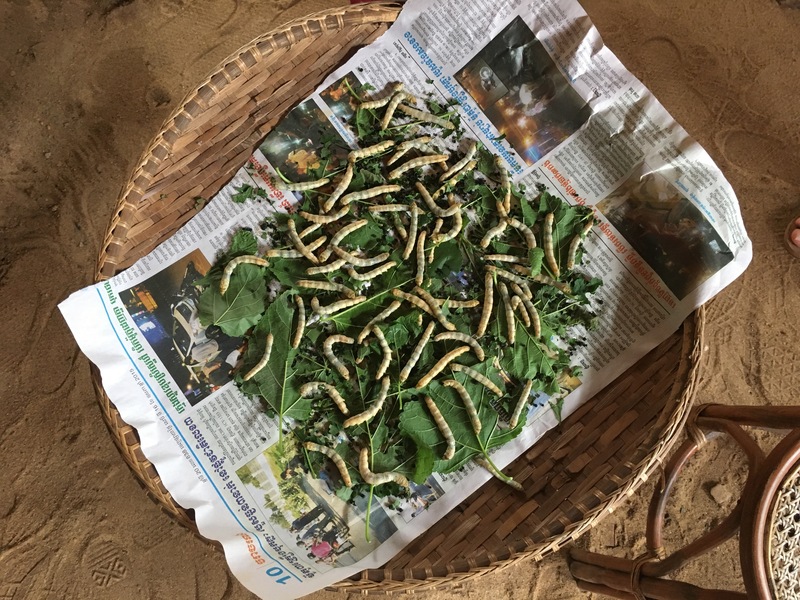 We spent about an hour looking at their cultures of silkworms and admiring the beautiful pieces created at the looms. 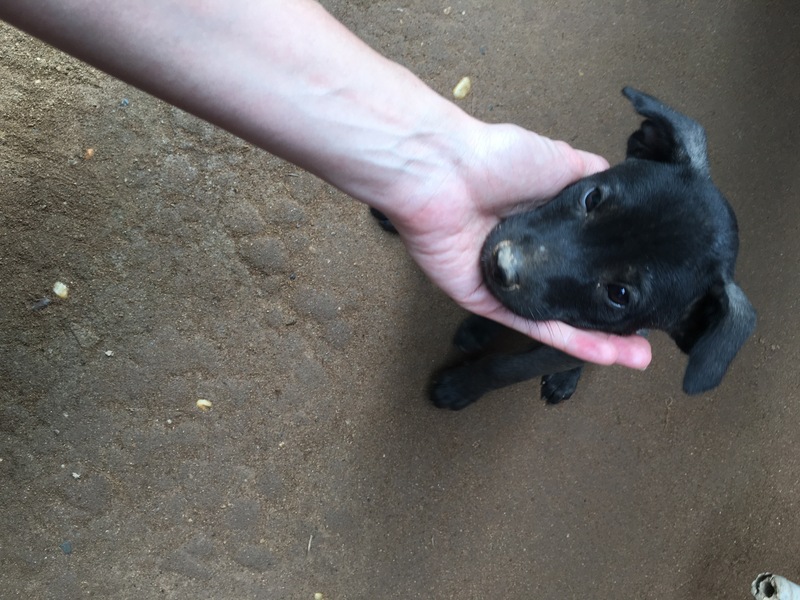 Also: puppies. 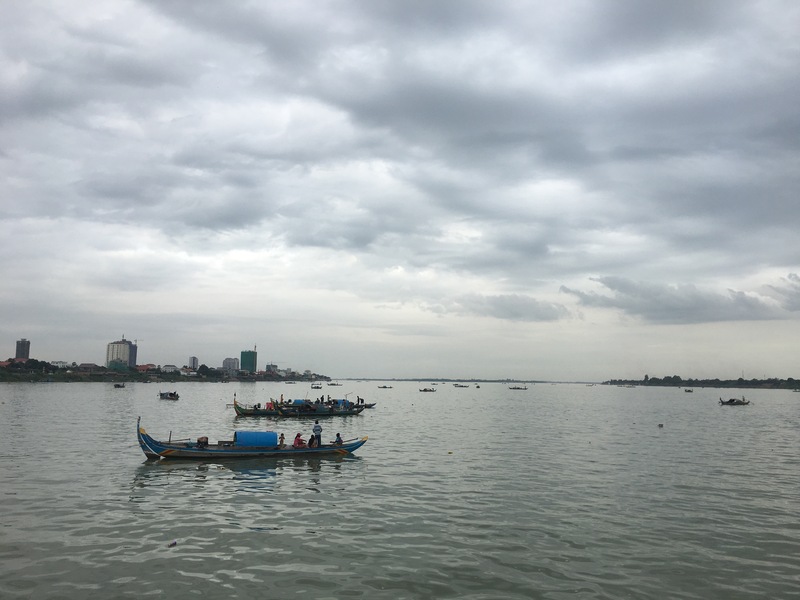 Our trip back took us along and across the Mekong. 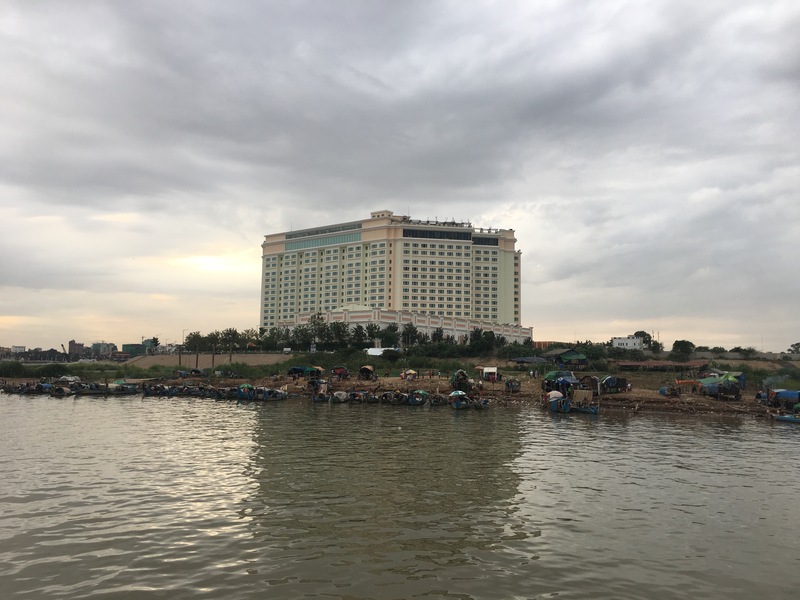 There are small communities of Muslims living either on boats or in derelict cottages on the shore with a perfect view of the largest casino hotel in Pnomh Penh – a monstrosity that would make any communist dictator proud. This was our last day in PP and we spent it packing our stuff for the trip to Ho Chi Minh City the next day. We had a great massage in the afternoon at The White Mansion Hotel and called it a night pretty early. And that was it for Cambodia. Our next big stop would be Bali via Vietnam and Singapore.